Bright and early on February 2nd, Phil comes out of his burrow on Gobbler’s Knob in Punxatawney, Pennsylvania, in front of thousands of followers from all over the world – to predict the weather for the rest of winter. According to legend, if Punxsutawney Phil sees his shadow, there will be six more weeks of winter weather. If he does not see his shadow, there will be an early spring. Keep your fingers crossed that he doesn’t see his shadow. I am ready SO for spring! 2 years ago, I made the trek to Punxatawney, Pennsylvania, to witness the Groundhog Day, festivities first hand. My mom, sister and both kids went with me. We stayed at a nearby hotel and I had every intention of having a nice breakfast and leisurely showing up to the event around 6am..just to make sure I got a good parking spot. At check in the clerk at the hotel told me the first shuttle for the event attendees was leaving at 3am. 3am! Say what?!? (I believe that was my response) Then he told me press and news crews were already on site. I checked in at 10PM the night before. I couldn’t believe it. I had no idea Groundhog’s Day was such a popular event. I had drug my family all the way to Punxatawney, I wasn’t about to miss seeing the Groundhog up close and personal. So I set my alarm for 2am and was on site at Gobbler’s Knob, the site of the big event by 3am. 3am is VERY early! Seemed even earlier on what was a very cold February morning. I am SO not a morning person, but I was able to work my way to the front row where I stood in the frigid air waiting for Pennsylvania’s Most Famous Groundhog. Even though it was f-f-freezing, the morning was actually lots of fun. There were bands, fireworks, people dressed up in costume, prizes shot into the crowd by air cannon…Good Times! Around 5am my bundled up kids joined me and Phil’s handlers gave them commemorative groundhog coins and stuffed animals. By 6am, there were thousands of people waiting for Phil to make his prediction. Around 7am, the bands cleared the stage, the crowd cheered as very official looking men in top hats took the stage to begin the big show. Who were the men in top hats you ask? Well, they were the gentlemen known as the Groundhog Club’s Inner Circle. 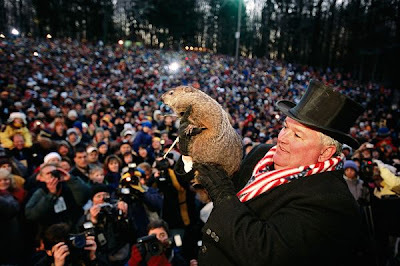 They’re a group of local dignitaries responsible for carrying on the tradition of Groundhog Day every year. They’re the ones who are not only responsible for planning the events every year, but they’re also responsible for the feeding and care of Phil himself! 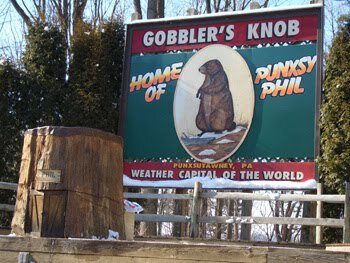 I love an experience and Groundhog’s Day at Gobbler’s Knob in Punxatawney was truly an experience to remember. My daughter was 4 years old the year that we went to Punxatawney and meeting Punxatawney Phil made quite an impression on her. We couldn’t get too close to Phil (we were told Groundhogs can have a bad temper), but the handlers were happy to hold him and pose for a few pictures with my kiddos. For the past two years my daughter has taken her special Groundhog’s Day coin to school and loved sharing her toddler tale of the event. 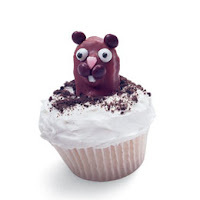 Groundhog Day Facts Impress your friends and family with your Groundhog Day know how. Click here to Print: Groundhog Day Word Search and find the Groundhog Day related words.